Home Budget Manager app for Android is a personal budget manager for home users. The app lets you enter transactions of all kinds and analyze income and expenses shown in the summary color-coded Overview chart. At a glance, you’ll see what you have and will have coming in, going out, and most importantly, what’s left over each month to spend or save. It’ll help you pinpoint costs and areas of excessive expenditure and control your finances better. 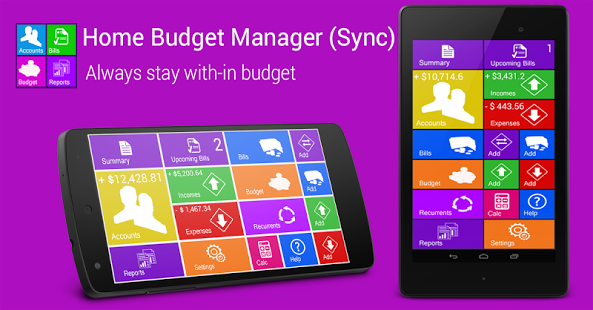 Home Budget Manager is available for download from Google Play for $3.99. Home Budget Manager app for Android opens to the most important window with the sidebar and tabbed main area. The sidebar gives you an idea about the calendar to select an active month of data, the form to add new transactions and totals of income, expenses and net income for a selected month, as well as0xpected totals for scheduled transactions. The tabbed area makes available a nippy access to transactions for a preferred month or day, recurring transactions, summarized monthly analysis of income and expense by categories and graphic overview for a year. Thanks to the intuitive design, the greater part of data entry and maintenance operations are less than two mouse clicks away. Adding a new transaction is amazingly easy. Quickly add a new one-time or recurring transaction from the sidebar form or the ‘New’ dialog on the toolbar, specify the type of transaction: Expense, Income, or Refund. Then choose the start date, the category, enter comments and to end with set up the amount. That’s it. Now the transaction record is displayed in the list of all transactions and in the Overview chart, showing your current financial position and progress for 12 months. You can edit, delete, search or print transactions with no trouble. Additional significant features let you switch among databases, backup and re-establish the database. Home Budget Manager Android app has nothing that could annoy the user. There are no banners, no ads embedded in icons, no links to sponsors luring you into paying money for the products or services you do not need – nothing that has no sensible value for managing your financial plan. Home Budget Manager for Android, unquestionably, makes you more attentive of what’s being used up and your purchasing decisions. Putting in a beginning balance throws off the page that looks like a checkbook register but if you put the beginning balance as income it works grand.